Wind energy (or wind power) refers to the process by which turbines convert the movement of wind into electricity. Wind turbines are built high (80+ m) above the ground or water to take advantage of faster, less turbulent wind than occurs at the surface. Offshore wind power has become one of the fastest growing energy technologies and is the focus of development in many countries around the world. Winds tend to be stronger and more uniform at sea than on land. In addition, there are large, potentially productive areas available offshore. It is predicted that by 2020 10% of Europe’s electricity demand could be met by offshore wind farmsSun, X., Huang, D., & Wu, G. (2012). The current state of offshore wind energy technology development. Energy, 41(1), 298–312. https://doi.org/10.1016/j.energy.2012.02.054. Europe is the global leader in offshore wind power. 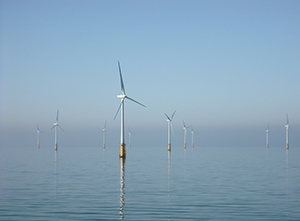 Underwater sound is generated during the construction, operation, and decommissioning of offshore wind turbines. Construction of wind turbines involves a variety of activities such as seismic exploration (with airguns), excavation with explosives, dredging, ship and barge operations, and pile-driving. All of these activities produce underwater sounds of varying intensity and duration. As a turbine operates, vibrations inside the nacelle (the housing that contains the generator, gearbox, and other parts) are transmitted down the main shaft of the wind turbine and into its foundation. These vibrations then propagate into the water column and seafloor. Mechanical noise generated by offshore turbines is concentrated at low frequencies below 1kHz, generally below 700 Hz. The level slightly increases as wind speed increases. A review of offshore windfarm related underwater noise sources. US Department of Energy, How do Wind Turbines Work.